Self-made video game challenges and runs have been a staple in recent gaming and can create exciting and new ways to replay your favorite games. There are a whole variety of them ranging from a no-kill run in Metal Gear Solid to only using your knife as a weapon in Resident Evil 4. Pokémon is no exception to this rule as one of the most famous video game challenges of all time is the Nuzlocke Run which actually makes the Pokémon games exceedingly difficult. Today, I offer you a different sort of run, one that although is not as challenging as a Nuzlocke Run, is still very enjoyable. I give you, a Single Type Run/Challenge. Simply put, a Single Type Run (or Monotype Run) is where you catch Pokémon who only belong to a certain type whether it is Water, Bug, Dark, or Dragon. If a Pokémon does not have a type in that category then it’s out. This is a great challenge I think because you can form a team around your favorite type(s) and not have to worry much about picking your favorites. Your team’s weaknesses are what make this challenging as you have to look out for moves or Pokémon that may defeat you. And to be fair, this isn’t exactly a brand new, exciting concept; many people have done this Run for a long time. That is why today, I’m going in depth and telling you what Pokémon games and types are the best for a Single Type Run. Let’s take a look! If you want to cut right to the chase, just click the image below that will explain everything to you concisely. Below the chart I have written my methods in approaching this monumental task and the overall best games and types for a Single Type Run. Before I analyzed a whole bunch of different pokedexes, I had to design a series of rules to make sure I kept my analysis consistent. As such, here are the rules for my version of the Single Type Run. A type must be selected before starting the game. Upon playing the game the player must make all attempts to capture a Pokémon of that type as soon as possible. Once captured, the previous Pokémon of the party must be disregarded if they are not of that type. Pokémon that have yet to evolve into that type (e.g., Nidoran in a Ground type Run or Caterpie in a Flying type Run) may be caught but must be evolved as soon as possible. Mega Evolutions that changes a Pokémon to your type are allowed provided you mega evolve the Pokémon as soon as their battle begins. Of course, everyone has their own version of the rules and that’s totally fine! This is just how I approached the analysis. In order to determine which Pokémon games are the best for a Single Type Run I had to design a categorizing system that was nonsubjective. What’s more, I had to find a simple but effective rating system that can satisfy all 406 possible combinations between typing and the games. This was solved by a dual grading system using numbers and letters. Every typing and video game combination has a one letter (A-F) and one number (1-4) grade for how beneficial a Single Type Run would be. Numbers indicate a game’s type diversity. For instance: 1=At least six unique catchable Pokémon, all weaknesses are neutralized/covered; 2=At least six unique catchable Pokémon; 3=Three-to-five unique catchable Pokémon; 4=Only one-to-two unique catchable Pokémon. Letters indicate how early you can catch a Pokémon: A=First Pokémon you can catch is before the first gym; B=Between the first-second gym; C=Between the second-third gym; D=Between the third-fifth gym; F=After the fifth gym. 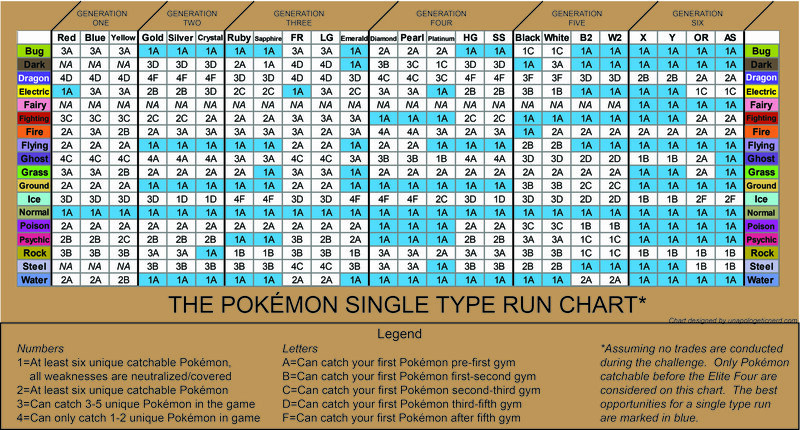 For example, if you were to do a Ground type run in Pokémon Red, you would have a 2A rating (i.e., you can catch at least six Ground type Pokémon and the first Pokémon you can catch is before the first gym (the Nidorans)). As such, a 1A rating in Single Type Run is the best rating you could get when selecting your type and game. You can catch a Pokémon fairly early on and you can get a diversified team that has all of its weaknesses covered. If that doesn’t bother you and are fine with doubling up, then hey, that’s cool. Surprisingly, given all the strict guidelines, there are a whopping 145 combinations that have a 1A rating. That’s 36%! This is mainly thanks to Generation 6 which had a huge diversity of Pokémon in their respective games (64% of their possible type combinations had a 1A rating). For the purpose of saving a lot of headaches, trading was not included in the Single Type Run Chart. Trading defeats the purpose of the Run as it’s much easier to get a team of six Pokémon (especially in the later generations) that has all of its weaknesses covered. This is why a lot of games on the Chart (such as Generation One for Bug types) won’t have the full team even if they have the diversity needed (Scyther and Pinsir are version-exclusive Pokémon). Also, Pokémon catchable after the Elite Four were not included as, in my opinion, you’re at the end of the game. I imagine you win the challenge once you beat the Elite Four. True, some games have a lot of content after the Elite Four (such as the Johto games), but this is only after hours and hours of playing the games. Tyranitar in Gold/Silver is a great example as you can catch Larvitar at Mount Silver but that’s only after you acquired 16 badges (and by then, what’s the point?). By far, the best Pokémon games for a Single Type Run are Pokémon X and Y followed by Pokémon AlphaSapphire, and then Pokémon OmegaRuby and Pokémon Platinum. Both Pokémon X and Y had a remarkable 1A ratio of 13-18. That’s unreal! And the other types that did not get a 1A were also pretty good as the worse rating was only a 2B (Dragon). And considering how this is one of the few games that an Ice type Run is actually feasible, I think this is a good bet to go for! Alpha Sapphire is the other game I recommend you play for a Single Type Run. It has a high amount of 1A ratings (11-18) and is the only game in the entire series to have a 1A rating for Ghost! This is thanks to Nincada in Route 116, a Sableye in Granite Cave, as well as the plethora of catchable Ghost Pokémon near the end of the game. The games to avoid would definitely be the Generation 1 games and that’s not surprising given the games’ initial lack of diversity. Pokémon Blue and Yellow only have one 1A rating (Normal) while Red has that and Electric. Ironically, the Electric type only sometimes acquires a 1A rating given their low diversity. If you want to do an Electric type Run in Yellow, catch a Pikachu and later catch a Magnemite, then Jolteon, Electabuzz, Voltorb, and Zapdos. I wouldn’t recommend this though given the mentioned Pokémon have a rather low movepool (look towards B2 and W2 if you want an Electric type Run). Normal, Normal, Normal, Normal! The Normal type is the only type that has a 100% 1A rating. This is thanks to Normal type having only one weakness (Fighting) which it can easily cover! Oh, and guess what! The Normal/Flying type combination is the most common type combination in the games. Every generation has introduced one and you are more than likely to run into one in the game’s first route. Boom, Normal’s commonality combined with its low weaknesses and early route availability makes it the perfect type for a Single Type Run. I recommend going old school and do a Normal type Run in Generation 1 as you can catch a plethora of iconic Pokémon like Jigglypuff, Pidgey, Tauros, Kangaskhan, and Snorlax. You will have a fun time as they are strong and can learn a variety of moves. If you don’t want Normal I would then recommend a Water type Run (although Ground, Bug, and Flying are also good). Again, their commonality and low amount of weaknesses make them a great type to do a Run. Water/Ground and Water/Flying Pokémon are surprisingly common and are introduced in almost every generation. These two potent combos cover Water type’s weaknesses and more than help you have a good time. If I were to recommend some games they would be Pokémon Sapphire, Emerald, and Alpha Sapphire. Pick Mudkip as your starter (Water/Ground), catch a Lotad (Water/Grass) in Route 102, and Wingull (Water/Flying) in Route 104 and you are set. From there, you are given a huge range of great Water Pokémon. Some off the top of my head are Gyarados, Crawdaunt, Sharpedo, Lanturn, Tentacruel, Marill, and Relicanth. Ice and Dragon type are the worse types for a Single Type Run. This is not surprising given they are usually available fairly late in the game and their diversity is rather lack luster. Surprisingly, Ice type received a 1 rating in Silver and Crystal but is severely marred by their late game status. If you want to do an Ice type run go for X and Y. Pick up the Sail Fossil, resurrect Amaura, and start catching some great Ice Pokémon. Unfortunately, Dragon type never gets a 1 rating although it has come close. As for which game, I’m honestly torn between XY and ORAS. On the one hand, you can get a Mega Sceptile/Altaria in ORAS although in X you can get a Mega Charizard X. Tough call. -If you want to do a Water type Run in Pokémon Yellow, your first Pokémon will be a Magikarp from the Pokecenter salesman outside of Mount Moon. Have fun! -In general, the third game in a series (Crystal, Emerald, Platinum, and B2W2) will have an increase in 1A ratings due to an increase in diversity. The only exception to this is Pokémon Yellow. -Remakes’ (FRLG and HGSS) ratings are generally similar to their original games as Pokémon availability are generally the same. The major exception to this is ORAS which introduced the National Dex before the Elite Four and not after. ORAS has a 1A rating of 11/18 (61%) while Ruby and Sapphire averages out to 6.5/17 (38%). -Despite being introduced in Generation Six, Fairy type has a 1A rating of 100% in all four Generation Six games. This is thanks to the variety of Pokémon from previous generations changing to the Fairy type like Mawile, Gardevoir, Marill, and Wigglytuff. So that’s the article! I worked on this for a couple of months, whenever I had time to kill or just wanted a break from my normal work load. I double checked my sources although I know I might have messed up a rating so if you spot something that’s incorrect, let me know! Happy playing! This entry was posted in Pokemon, Pokemon Single Type Run, Video Games and tagged Bug Type, Dark Type, Dragon Type, Electric Type, Fairy Type, Fighting Type, Fire Type, Flying Type, Generation 1, Generation 2, Generation 3, Generation 4, Generation 5, Generation 6, Ghost Type, Grass Type, Ground Type, Ice Type, Monotype Run, Normal Type, Poison Type, Pokemon, Pokemon B2W2, Pokemon Blue, Pokemon BW, Pokemon Diamond, Pokemon GSC, Pokemon ORAS, Pokemon Pearl, Pokemon Platinum, Pokemon Red, Pokemon RSE, Pokemon X and Y, Pokemon Yellow, Psychic Type, Rock Type, Single Type, Single Type Run, Steel Type, video games, Water Type on February 29, 2016 by Andy.